I did not want to sit out this month’s Daring Bakers’ challenge, even though I have so many tarte tatin recipes on my blog, both sweet and savoury. I also had planned on making my own pastry, but decided it would be more prudent and cost saving to use what I already had in my freezer. I wanted to make the recipe slightly different and so used phyllo pastry instead of the traditional puff pastry. I had in mind a cheese course and so made a fig tarte tatin which I served with a Gorgonzola ice cream. Figs are in season right now, and when preserved in syrup they are often served with a selection of cheeses. I added walnuts to my tatin as this nut compliments both the cheese and the figs. You could leave them out, or substitute them for another nut if you plan on serving the tarte tatin without cheese. It got a big thumbs up for taste and texture which is a great result coming from my biggest critics. Blog-checking lines: For the March Daring bakers’ challenge, Korena from Korena in the Kitchen taught us that some treats are best enjoyed upside down. She challenged us to make a tarte tatin from scratch. Love the idea of putting this with a cheese board. I like the idea of using up things from your freezer. It’s on my ‘to do’ list too. Fab – Tandy – figs are in-season here too so am going to give this a try – thanks. 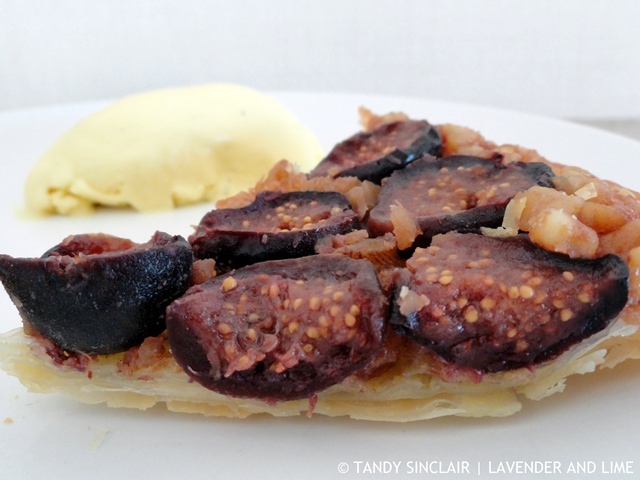 I adore figs and not-too-sweet treats – so this tatin is perfect for me! YUm! Oh wow!! This looks amazing! Great recipe girl! YUM!